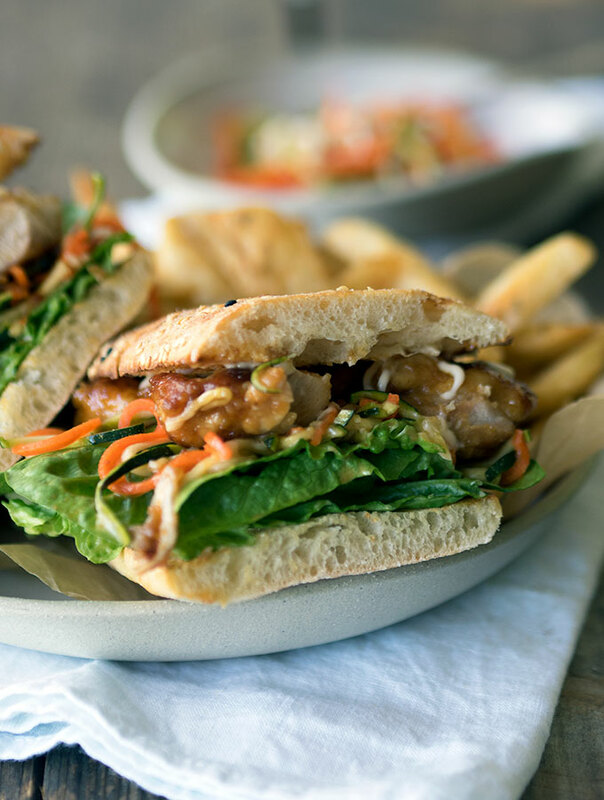 Forget about the take away, make these teriyaki chicken burgers for your family instead. Saucy teriyaki chicken topped with salad, quick carrot and zucchini pickles, and Japanese mayonnaise. Dinner. I hate making dinner. Probably something you weren’t expecting me to admit, but I hate it. Just like every other person on the planet, I get stuck with what to make for dinner at times (more times than you would expect). Mainly I don’t feel like cooking after a long day. Often after a day where I have been working with food, where I have no idea what I feel like, but still need to feed the tribe. There is the pressure to provide a meal for my family. Each night, it’s me. I’m sure you can relate. Just like me, I’m sure you get over it very quickly. It’s continuous cycle of “what’s for dinner”. To combat my “I really don’t want to cook tonight” slumps I have a few recipes up my sleeve that are quick and satisfying. They also give the feeling of a sneaky takeaway, but taste wise are 100% superior. 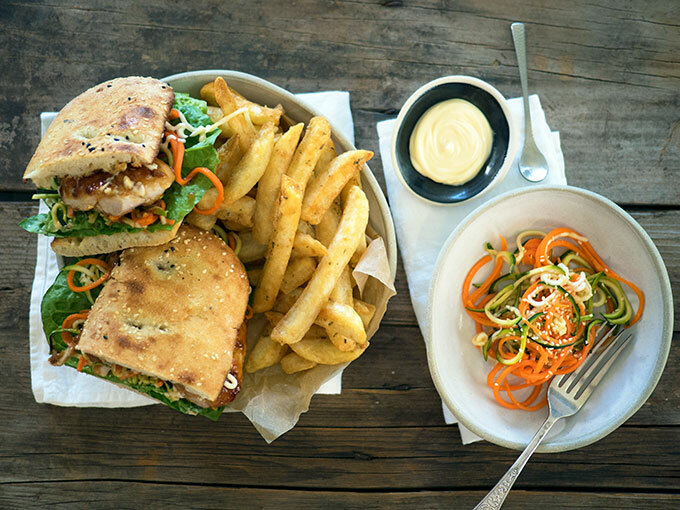 My teriyaki chicken burgers are one of them. 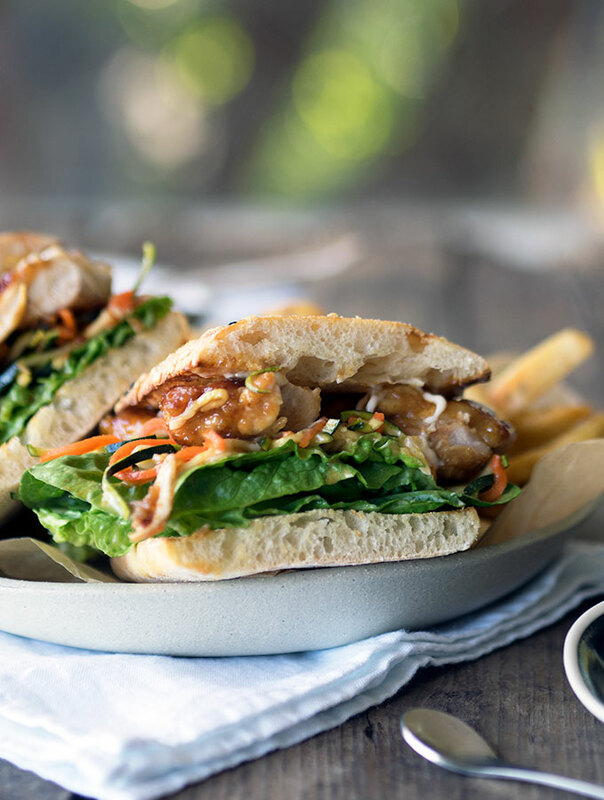 These teriyaki chicken burgers are quick and easy to make, and flavour packed. One thing I love about these burgers is the lovely sauce coating your chicken fillet ends up with. The chicken is dusted lightly in flour and then fried with a little oil in a non stick pan to give some crunch. When the sauce ingredients are added to the chicken they thicken to a saucy coating. What really completes my teriyaki chicken burgers are my quick carrot and zucchini pickles. You can find the recipe for them here. I have a constant supply in my fridge and find them useful for adding some crunch and zing to a variety of dishes. Why not try our Baked Beer Can Burger Recipe! These burgers really are a winner. Juicy chicken thigh fillet covered with lip smacking teriyaki sauce. Accompanied with sweet and tangy quick pickles, red onion, crunchy lettuce and some mellow mayonnaise, it’s a super flavour combination. As an alternative serving suggestion, why not place all the ingredients out on the dining table and let everyone make their own. One less thing you have to worry about. 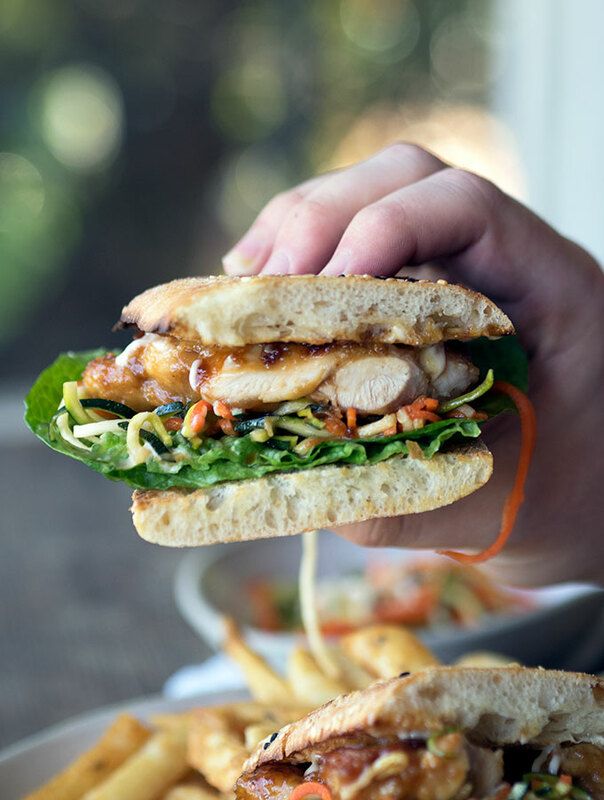 I hope you enjoy these teriyaki chicken burgers as much as we do. In a small bowl combine soy sauce, mirin, sake and caster sugar. Mix until the sugar has dissolved. Set aside for later use. Lightly coat chicken thigh fillets with flour, shaking off any excess. Heat oil in a non stick fry pan on a medium heat. Add chicken and fry until golden and cooked through. Add soy sauce mixture to the pan and bring to the boil. Keep stirring and coating the chicken with the sauce until it thickens. Remove immediately from heat. To assemble burgers: Place lettuce, onion and pickles on the bread roll/bun. Top with a chicken thigh fillet, some extra teriyaki sauce and mayonnaise. Serve with hot chips/French fries if desired. I don’t mind cooking dinner so much (although, having raised 3 kids to adulthood I really think I’ve done my time there), it’s the relentlessness of having to decide – every, single, day – what to make. That’s where inspirations like this come in handy! Looks delicious Sara. Sometimes it is a chore for sure. I hear you Sista – after a big day at work or play theres’ no chore like the dinner cooking chore – that’s for sure! Keeping eating interesting, nutritious and yummy is the challenge but I think you have achieved big time with these burgers.